Further, March saw private sector business activity in Germany rise only modestly and at the slowest rate for almost six years, according to the latest PMI data, with the report indicating a deepening downturn in the country’s manufacturing sector. The first monthly fall in employment at goods producers in three years meanwhile saw the overall rate of jobs growth ease to the lowest since May 2016. In addition, IHS Markit Flash Composite Output Index slipped to 51.5 in March, thereby reversing the interim gains seen in January and February (when the index reached a four-month high of 52.8) and signalling the slowest rate of business activity growth since mid-2013. Overall inflows of new business at German firms fell for the third month in a row in March, with the rate of decline broadly unchanged from that recorded in both January and February. A solid and accelerated rise in new work in the service sector – the most marked since September 2018 – was more than offset by a sharp contraction in manufacturing order books. 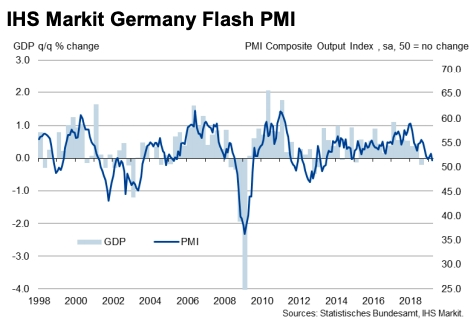 The downturn in demand for German goods continued to be largely driven by a slump in new export orders, which fell for the seventh month in a row and at the quickest rate since August 2012. Anecdotal evidence highlighted delayed decision-making among clients due to uncertainty, as well as weaker demand in the automotive sector. "The domestic market remains strong, which continues to be reflected in wage pressures and robust growth across the services sector of the economy, but the question is whether it can withstand a protracted downturn in manufacturing. The first decrease in factory employment for three years is perhaps a warning sign for the health of domestic demand, with overall job creation now running at its lowest since May 2016," said Phil Smith, Principal Economist at IHS Markit.